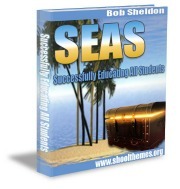 Presenting a great way for students to recognize certain topics or events in a special manner. The best part is that school days designed to focus on a particular subject can be used in multiple situations and for a myriad of topics. Students learn most effectively through positive reinforcement and personal involvement. A great theme idea can provide students a chance to become actively involved through participation. They build spirit and school unity and they also convey important messages about school priorities. Themes can also be used to build school spirit. It is common practice at all grade levels to have themed days that encourage special clothing to be worn, such as school logo shirts. Traditional themed days have focused on encouraging team support. While this remains a critical skill, schools now have become much more involved in building child awareness of the world at a young age. They encourage civic duty and caring attitudes toward those less fortunate. As a result, school themes have expanded beyond the single school spirit initiative and focus. Theme activitiess that focus on a particular day have grown to include many different topics. The list could go on indefinitely. A theme day can be held in a manner similar to traditional spirit days. There will be special bulletin boards, themed assemblies, announcements and themed civic projects included as part of the program. These theme days can motivate students to become more involved in the world and their communities. In these days of handheld electronic toys stealing student focus, a theme day can play an important program role helping to build student awareness. Promoting your school's theme day is accomplished with plenty of individual creativity. Every school is part of a community and student involvement helps build that necessary and desired communal support. Community support is critical for successful fundraising activities. But even beyond that goal, school themed days begin the process of teaching students what an important role they can play as good citizens. Most schools have designated annual theme days, but many have considered expanding the program. If you are not sure how to design new theme days, there are many examples to be found on the internet. Theme supplies and teacher instructional aids can turn school theme days into an important part of the regular curriculum. 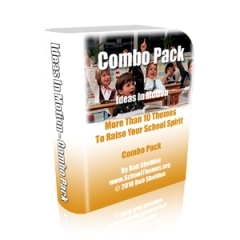 Themes make it easy to coordinate programs and encourage total school involvement. Students, teachers and supporting staff members participate in school day celebrations related to the theme of the day. After all this talk about responsible citizenship, it’s important to remember that school theme days are fun! They can help raise student interest and excitement. Banners, posters, flyers, logos, mascots, food, assembly speeches and guest visitors all go into making special school celebrations throughout the school year. If your school does not have theme days, now is the time to start. 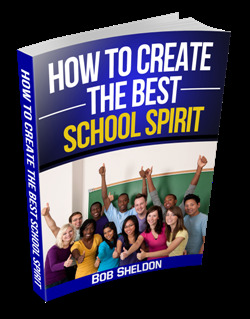 The world is getting smaller by the day, and your students can't wait to show their school spirit too. And remember to make your free school theme selection. Leave School Theme Days and Get Your School Theme!